With a little help, support and guidance, we can teach you how to coat & decorate the most amazing cakes! You will gain all the skills required to produce your family and friends latest requests. This course is thoroughly recommended for beginners or those wishing to brush up on existing skills. Plenty of time for questions, practise and fun! 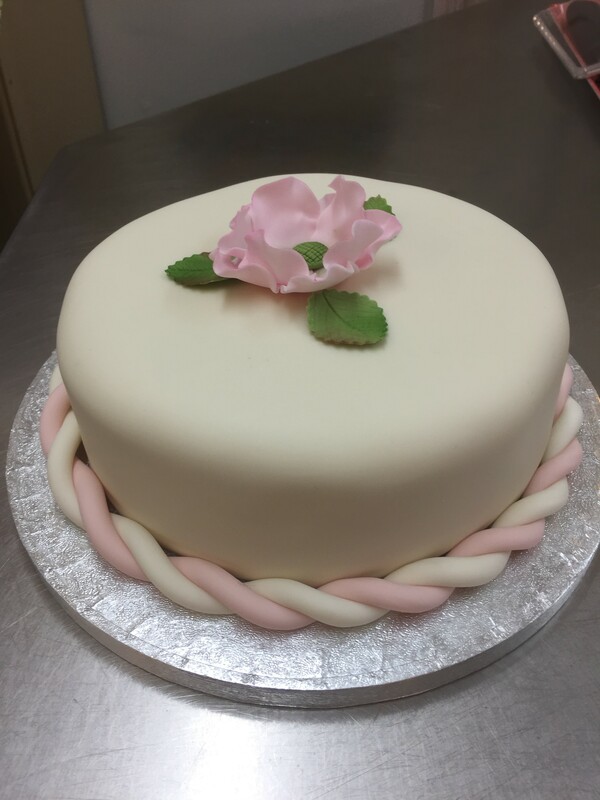 At the end of the course you will take a home a cake like the one shown in the picture or you can use the skills you acquire to decorate a cake in your own style. All refreshments and materials are supplied by us & there is NO need to buy any equipment as we supply everything that you may need. • Learn how to line a variety of shaped cake tins. • Professionally cut and layer your Genoese with our buttercream, then mask your cake. • Learn how to coat, colour and shade your Sugarpaste. • Learn texture and embossing. • How to Sugarpaste a cake board two ways, preferred method and why. • How to attach tie ribbons and attach board ribbons. • How to store your cake, How long it will keep and more. 1 x 5 Hour session including light lunch. £100 Subject to 2 clients booking. Be the first to review “Introduction to Sugar Paste” Click here to cancel reply.